Thinking about going green with an eco-friendly bathroom or shower room? European Bathrooms, luxury bathroom designers in Windsor and Amersham has over two decades’ experience of delivering stylish new bathrooms, including the latest environmentally-friendly bathroom suites, showers and accessories. The fantastic thing about installing an eco-friendly bathroom is that it not only helps protect the environment by saving resources such as water and energy, but helps save money on bills. For eco-inspiration, our expert designers have put together three ways to create an eco-friendly bathroom. Hansgrohe EcoSmart Showers – Hansgrohe, a leading German bathroom manufacturer and champion of ‘Green Bathrooms’, has pioneered one of the best water-saving shower systems. All Hansgrohe showers and mixers feature unique ‘EcoSmart’ technology, which means they use 60% less water than regular products. Using less water also means less energy is required to heat it, in turn reducing carbon dioxide emissions, which add to the greenhouse effect. 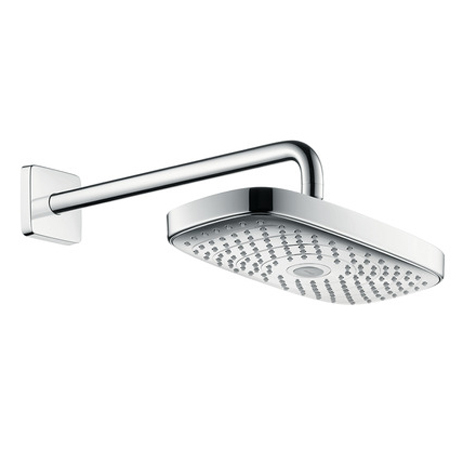 If you’re looking for a stylish, water-saving shower, Hansgrohe’s Raindance Select EcoSmart overhead shower, gives the same refreshing effect of a rainfall shower but uses only nine litres of water a minute. You can also adjust the water jet at the touch of a button, from gentle water droplets to revitalising massage mode. Another popular eco-friendly shower system is Hansgrohe’s Ecostat thermostatic shower. This includes an ‘Ecostop’ button to limit the amount of water to 10 litres per minute without compromising the shower’s feel or comfort. Call into our Windsor or Amersham bathroom showrooms to see our Eco-friendly showers. Villeroy & Boch’s Water Saving WCs – Villeroy & Boch bathrooms combine beautiful ceramics with cutting-edge technology. As well as showcasing slimline sinks, which look stunning and use less water overall, WCs come with a choice of two water-saving systems. If you’re serious about conserving water Villeroy & Boch’s ‘GreenGain’ WC uses 40% less water than conventional toilets, without reducing flush power. It also has the option to reduce water output to just two litres. The other option is Villeroy & Boch’s AquaReduct system. This cuts water-use from 6 litres to 4.5 litres, again without losing any flush performance. For stylish yet super water-efficient bathrooms, see Villeroy & Boch’s Architectura and Subway 2.0 collections which combine minimalist, clean design with water-conserving basins and AquaReduct WCs. For further information call in or contact European Bathrooms. Bisque Eco-Friendly Radiators – Modern bathroom radiators have evolved from over-sized, energy-hungry metal monsters into energy-efficient, elegant works of art. 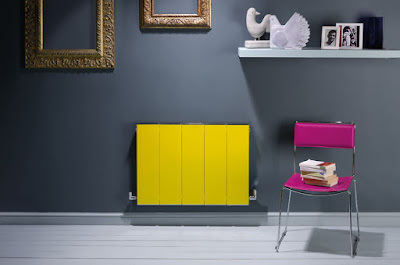 Take Bisque’s latest generation of aluminium radiators. As well as made from recycled aluminium - which requires up to 95% less energy to produce than extracting the metal from the ore - they are extremely thermally efficient, heating up and cooling down quickly and using less water to reach the ideal temperature. And the green points don’t stop there – when an aluminium radiator reaches the end of its radiator-life, it can be recycled too. If you’re looking for a sleek, modern radiator with some serious eco-credentials, check out Bisque’s Blok radiator. Its slim profile (80mm) is ideal for maximising bathroom space and can be finished in a range of colours and finishes, from discreet neutrals and nickel finishes through to eye-popping pinks, blues and yellows. If you’d like to know anything about any of the above eco-friendly bathroom showers and fittings pop-in to see us. Bathroom floor and wall tiling and decoration for a professional finish. To find out more or book a free design appointment, call our bathroom experts today: Windsor showroom 01753 865 050, Amersham showroom 01494 434349.